When you think about University of Alabama atheltics, the first thing that likely comes to mind is football. After all the Crimson Tide is a college football legend and earlier this month picked up yet another national championship title. What many don’t realize, even in Tuscaloosa where the University is based, is that there’s also the Frozen Tide. Yes, Alabama plays hockey and they have for the past eight years, most recently as part of the South Eastern Collegiate Hockey Conference (SECHC). Over the years the Frozen Tide has built up a solid program, getting all the way to the American Collegiate Hockey Association (ACHA) Division 3 Nationals in 2012 and looking good do it again this year. It might seem unexpected that a team playing in the traditionally conservative south would take a stand in support of LGBT athletes, but the Frozen Tide is ready to create change. “We’ve got a lot of guys that aren’t from here originally,” Davis says. “We’ve certainly got southern hockey players, but we draw from all over—California, New York, I’m from Colorado. We have as much diversity as you can find in a hockey locker room. There is a conservative stereotype to the south and, for better or worse, it lingers, perhaps longer than it should. We feel we’re in a position as athletes for the university to speak out. The team plans to make the video after the season is over. While the regular season concludes February 8, there are still two critical contests. 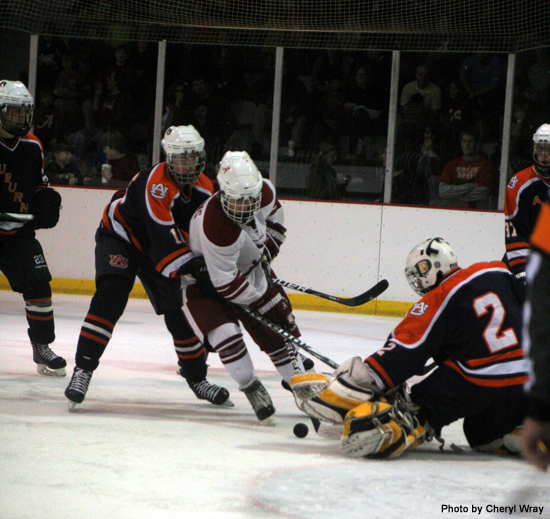 First up the Frozen Tide defends its 2012 SECHC championship at the 2013 SECHC tournament February 22-24. Then the team has its sights on the ACHA Division 3 Nationals March 12-16. 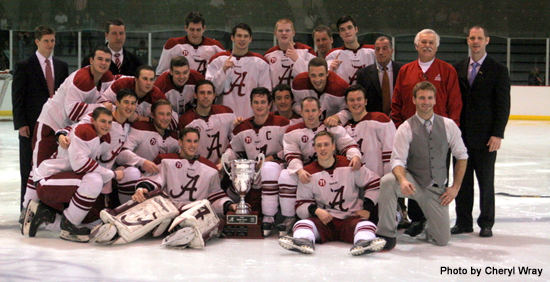 The 2012-13 season is the fifth for the SECHC, although some of the schools that play in the conference, like Alabama, have had hockey teams for longer. You can tell by its schedule that Alabama means business. While most of the schools in the SECHC play a 20-25 game regular season, Alabama plays more than 30, as does Arkansas. In addition to playing the mandatory two games each against their Western Conference rivals, Alabama plays Eastern Conference teams, travels up to Michigan for games, plays NCAA D1 Alabama-Huntsville and travels around the south playing other college teams that are outside the SECHC. Davis says there are a lot of logistics and time commitments to make the game schedule, and the practices, work. “In Colorado, I can be at four different rinks in 15 minutes drive. [The Frozen Tide] travels 55 miles each way to practice once a week and then plays games all over. If we had the ability we’d play more, but it costs a lot of money. Recruiting is key to keeping the program alive and, since it’s a club sport, there are no hockey scholarships at Alabama. However, the team works with potential players to see if there are academic scholarships they qualify for to help get them to Bama. The team gets the word out via recruitment websites and word of mouth. Tuscaloosa was home to a well-received outdoor rink over the holiday season. While the 65-foot by 85-foot rink was a success, it was certainly too small for hockey. One of the cornerstones of the Alabama football season is the annual Iron Bowl game with Auburn University. 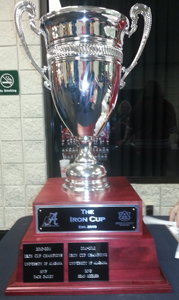 In 2010, that rivalry took to the ice in the form of the Iron Cup. This year’s cup games took play January 11 and 12 in Pelham and became the Frozen Tide’s best-attended games of the season. 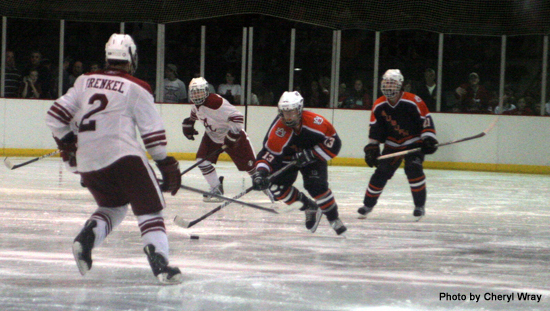 While Friday’s game had around 2,000 attendees, Saturday’s packed the rink to a capacity 3,500 crowd. His return to the Frozen Tide saw him pick up an assist as well as a couple minutes in the penalty box. Unfortunately, he also injured his ankle, which took him out of Friday’s game during the third period and kept him on the bench for Saturday. The injury overall was minor and Davis expected to be on the ice the following weekend versus Clemson. Meanwhile, the Frozen Tide picked up its third Iron Cup victory (yes, they’ve won it every year its existed) with a 7-5 win on Friday and 8-2 win on Saturday. They managed those wins with three of the seniors out with the flu, which was countered by an outstanding showing from freshman player Andre Morard who scored four goals Saturday night and was named MVP for the series. 1) Alabama plays strong hockey. I saw that when I went to the SECHC Showcase games last year and it was evidenced again this year. They’re fast, their penalty kills are great to watch because they tend to be aggressive on the forecheck and they’ve got a solid passing game. 2) Auburn loves penalties. I don’t know the exact stats, but they were in the box… a lot. I’d say four or five times as much as Alabama was. 3) The third period of the Saturday game was very odd for Auburn. It was almost like they’d forgotten how to play the game with poor passes and defense that couldn’t keep the puck in their offensive zone. The third period started at 4-2 and it felt like there could be a dramatic ending, but it ended up 8-2 as Bama capitalized on Auburn’s constant mistakes. I’m not sure if Auburn got over aggressive and lost focus, but it was an interesting collapse to witness. 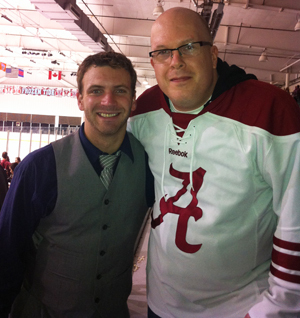 You can follow Alabama’s Frozen Tide very active Twitter feed at @AlabamaHockey or check out their website at BamaHockey.net. This entry was posted in College Hockey and tagged Bama: The Frozen Tide, SECHC, University of Alabama, You Can Play. Bookmark the permalink. Reblogged this on Woody Bass.